A tri colour LED. There is a single GND pin, and three +5V pins, one each for RED, GREEN and BLUE. There are 3 separate bulbs inside this one glass outer case. There are 3 coloured LEDs within the bulb, coloured Red, Green and Blue. Put a varying voltage through each, and you get a mixture of the colours. Pins 10, 8 and 7 are used as +5V outputs through resistors to the appropriate LED RGB input. The LED then returns to GND. This is the code that I used. 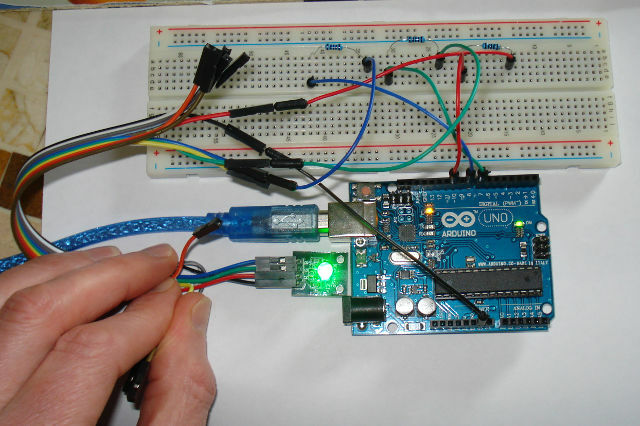 Originally written to control 3 separate LEDs as a 'traffic light', the code can be reused to make the tri-colour LED light up. This is using the digital outputs to give maximum brightness; we will use the analog outputs afterwards, to write out varying values to control the intensity of each colour.